If you thought some of the fetes the MINI Cooper pulled off in the 2013 blockbuster, the “Italian Job,” were impressive− than wait to you get a load of the car’s most recent starring role. As part of Philadelphia’s Schuylkill River being held this weekend, a boat version of the popular MINI Cooper is being featured as part of an annual collegiate rowing competition. The MINI Convertible boat, built by ACI Composites based in Lancaster, Pennsylvania, is making a star appearance at this weekend’s Aberdeen Dad Vail Regatta in Philadelphia. 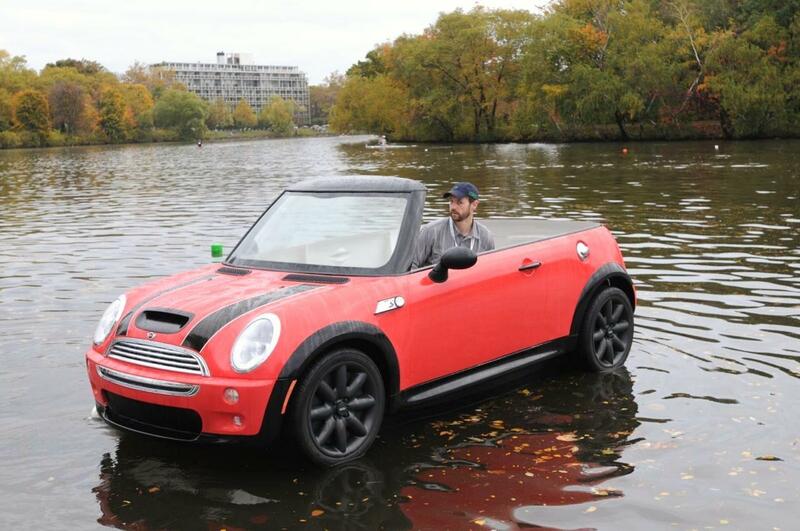 The brainchild of the MINI USA Eastern Region, the Mini Cooper boat was constructed last year as part of the automaker’s “Not Normal” sales event. While less publicized, the one-of-a-kind boat was spotted earlier this year motoring up the Chicago River for the city’s St. Patrick’s Day celebrations. While the boat looks identical to the MINI Cooper and has some authentic MINI parts like the grille and headlights, the floater is actually a fiberglass mold of the car mounted to a boat hull. The MINI Cooper’s four-cylinder engine has been replaced with a 6 horsepower outboard motor. So, anybody up for a ride?